Loft Beds for Adults – One of the biggest problems that an apartment dweller has always dealt with is the limited space. Expanding the size of the room is pie in the sky, thus installing loft beds for adults to spruce your room up can be a terrific idea. Loft beds provide additional space that you can occupy for various kinds of activities – working area, mini library, game room, or whatever you want! 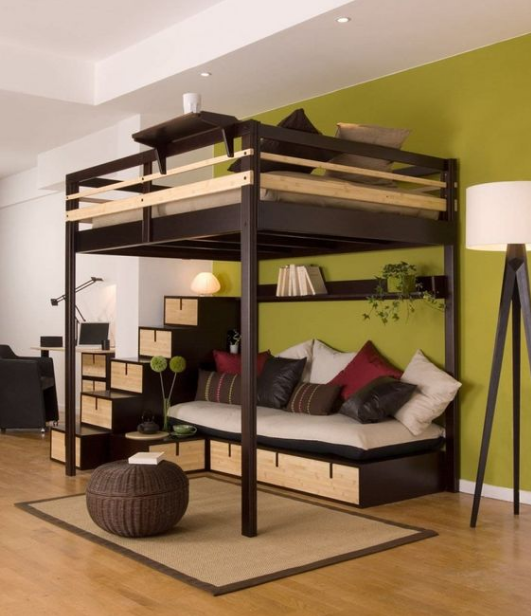 If you are seeking some creative ideas to tweak your room a bit using loft beds, read on to find 19 loft bed ideas to tackle your cramped room. Sharing a room with a friendcan be a lot of fun. You can chit chat all the time, watch some movies, or study together. Unfortunately, there is not enough space to put a desk for doing your assignment. Well, you could do it on your bed or living room actually, but it will not be comfy at all. You can still share the joy of friendship and have a private desk in your bedroom. Yes. You can have them both. Loft beds enable you to optimize the space of your bedroom without ditching the other bed or expanding the room which may cost an arm and a leg. Just elevate one of the beds a little bit, place the other one right under the first one, and add a desk next to the lower bed. Problem is solved! Cramped room is such a pain in the neck. You can do nothing but staring at the ceiling.Now roll up your sleeves and get ready to triumph over the extreme cramped room by installing a loft bed. The elevated bed provides more space beneath it, making it possible to add more furniture like drawers, wardrobes, and cabinets to store your clothes and books and keep them neat. Your room will look more spacious and neater. The unavailability of safety rails can lead to danger. Your room has plenty of space, but you still want to perk it up? No problem! Loft beds can be fruitful as well. The long bed floating over the two beds can be a great nook as well as a storage rack where you can store your pillows and dolls. If you want to experience something different, you can lie on it while enjoying playing games on your PSP. The stairs pack storages that you can use to store books, magazines, or any odds and ends without compromising the exquisite design. Typical bunk beds found in a summer camp or retreat center. One bedroom usually accommodates up to 12 people depending on how large the bedroom is. 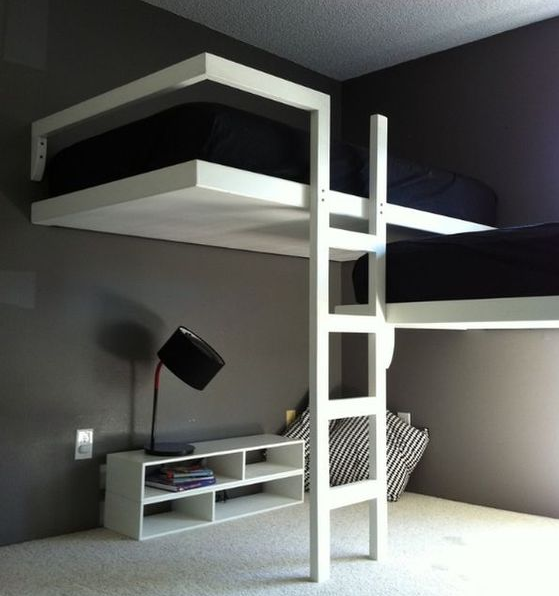 Since one bedroom is occupied by many people, harnessing the height of loft bed will be such a brilliant idea. 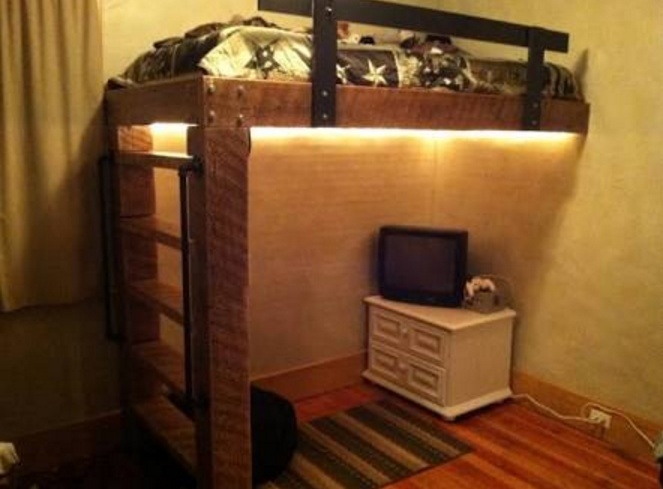 The use of loft bed idea in a summer camp can overcome the storage problem. Byusing loft beds, there will be more space that you can use for other furniture such as drawers, wardrobes, and bookshelves needed by the participants of the camp. Your pretty little princess is going to love this loft bed idea. All she needs a bed, desk,and chic and comfy sofa can be found right in one spot. Now her cramped room has turned into her lovely basecamp in which she spends most of her time. There will be more space that you can use for drawers or wardrobes. The vibrant pink color can jazz the bedroom up as well as buck your daughter up. The simple design provides the touch of modern look. This loft bed idea can only be implemented in a girl’s room due to the sweet pink color. Edgy shapes, simple color palettes, and fewer adornments are the significance features of a modern interior design. 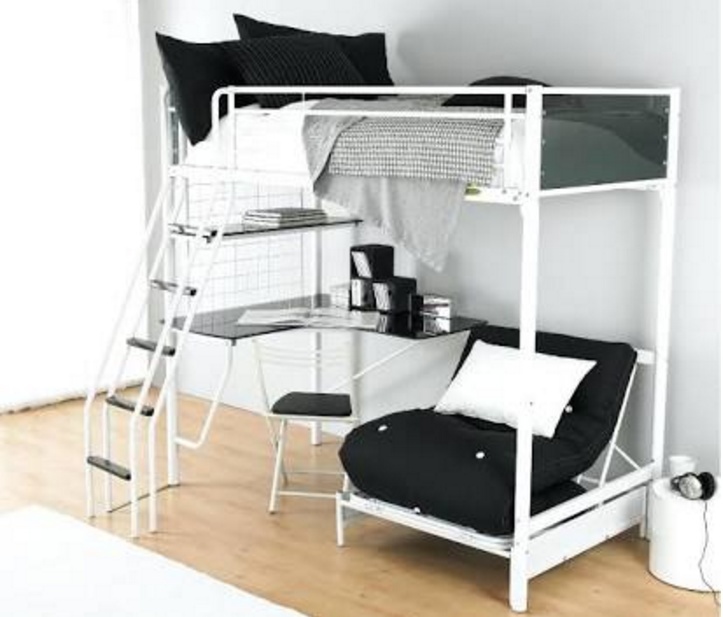 This cool loft bed embodies “less is more” through its simplicity. Decorations are not something that it needs to work on. A single silhouette of London Bridge patched on the wall beneath the loft bed is enough. The space under the loft bed is used for a cozy working area. You can store your documents in the shelves or drawers. To kick the desk up a notch, a small desk lamp and two photos are added. Do you find any stairs there? The stairs are the cool part of this loft bed because they are not ordinary ones; they are built-in stairs. 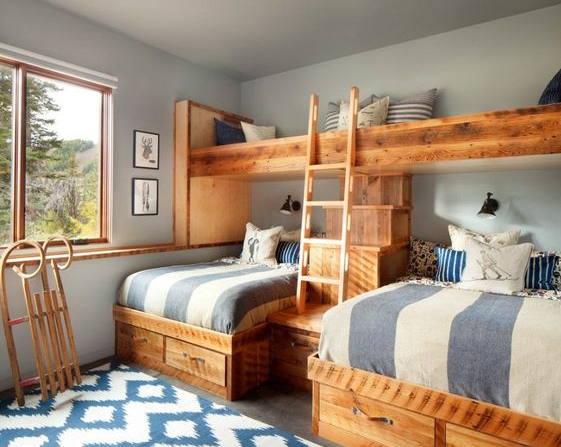 Buck your kids up with this fun loft bed idea. 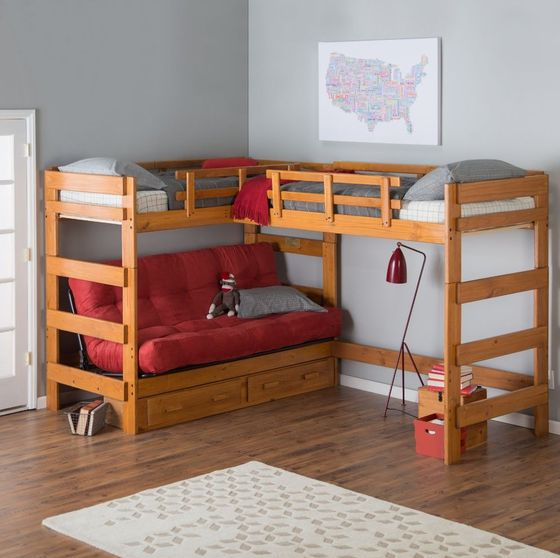 Unlike typical loft beds that are only a few inches from the ceiling, it low loft bed is only a few feet tall, making it a safe haven for your kids. 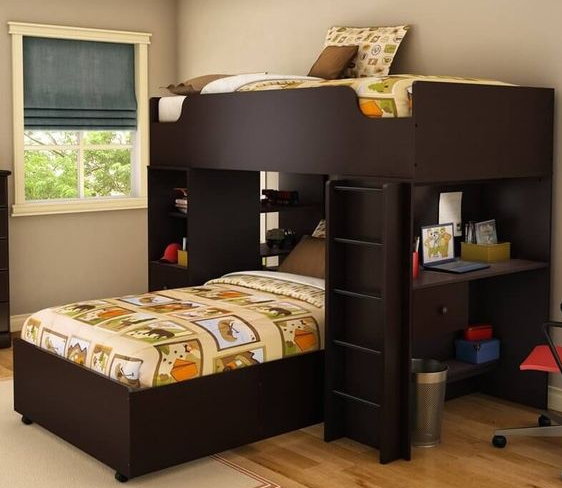 You do not need to worry about a terrible accident that may happen due to tall loft bed. In addition to being a safe place to take a nap, this loft bed also packs a lot of fun, thanks to the built-in slide leaning on the bunk bed. They can also explore their imagination by staying at an indoor camp located under the bunk bed. Loft beds do not always about sleeping in a narrow elevated bed, they can a quite big size bed that can accommodate up to two people. Since the bed is quite large, plenty space under the bed is available, creating an abundant of creative ideas such as a working desk or simply a comfortable sofa for reading corner. Storing things will not be a big deal any more because the stairs provide plenty of storages that you can use to store clothes or books. Have you ever felt bored when you have to sleep in the same direction? 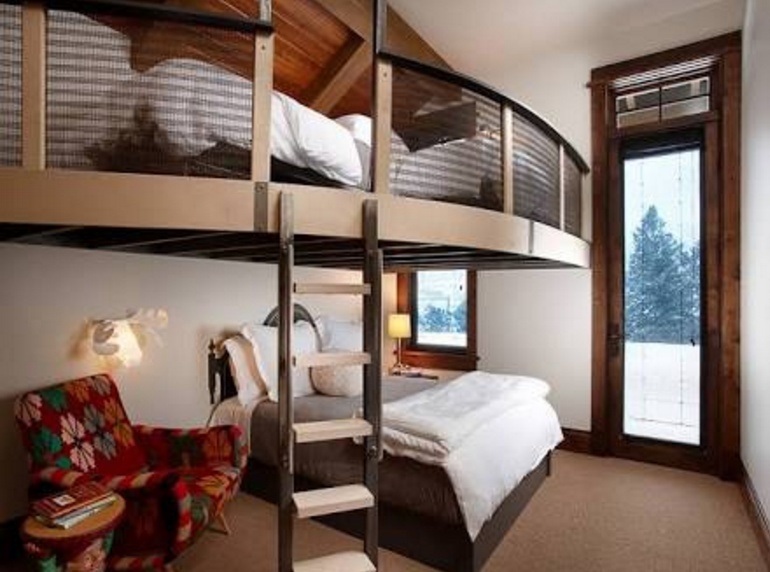 This loft beds consist of two small size beds arranged in different directions so that you can get rid of your boredom. Not to mention the built-in stairs that enable you to climb up the bed easily. The spacious area underneath the beds can be used as a relaxing nook where you can sit on the sofa while reading your favorite books. Right under the sofa are two drawers that you can use to store things. The unique standing lamp is an icing on the cake. Staying in a small cramped room can be irritating because there is not enough room for you, let alone your brother. Unfortunately, you have to share your room with your brother since you live in a small apartment. But don’t worry! There is always a way to beat the limited space and perk it up. Harnessing the simple monochromatic colors and the edgy shapes give a touch of minimalist interior design ── attractive despite the lack of decorations. 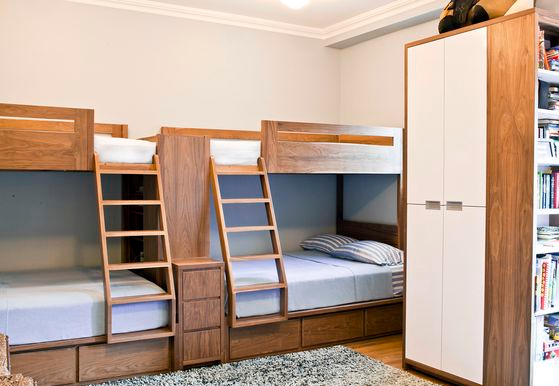 To take your bedroom to the next level, arranging the bunk beds in different positions is a good idea. Attaching the bunk beds to the wall make them look like floating beds. Haven’t found the best idea to spruce your bedroom up? Let’s go white! White is one the neutral colors that can be used for any interior designs. It provides clean, neat, and elegant look. However, white is not the only one color that makes this loft bed look awesome. The combination of sleek design and pastel colors complements the design of the room very well. Adding some furniture such as a low-level table, chair, a rug, and some cushions can provide an ultimate comfort in your room, creating a safe haven in which you can explore your creative ideas or simply share stories with your besties. Your baby boy has grown up now. He is not a little baby who is used to sleeping on your lap anymore. He is a big guy at least, that is what he calls himself who wants to be brave and independent. It is time for him to have their own bedroom. But then, you realize that there is not enough space to do it. You can still use the remaining space under the stairs or in the attic. 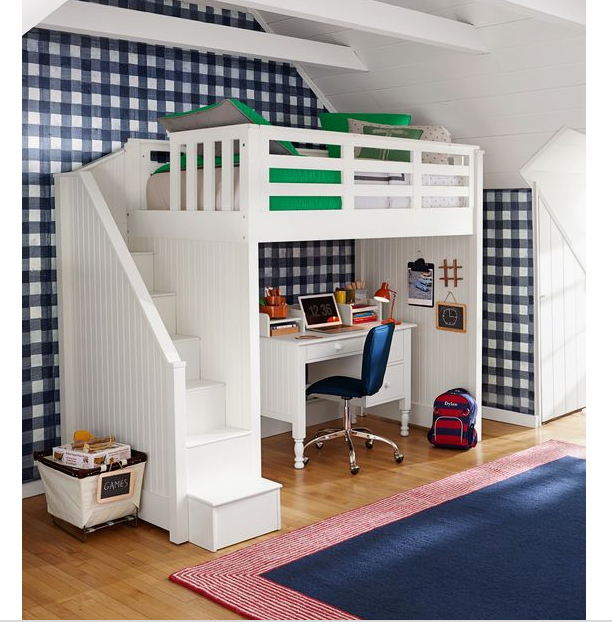 Loft bed enables you to have a multipurpose room in one spot a bedroom and studying room. Your son will be able to hit the sack comfortably and do his homework well. Do not forget to install a safety rail to keep him safe while sleeping. Turn your bedroom into a private workstation and experience a fun and relaxing way to meet the deadline. Racing against the time is somewhat stressful. Therefore, you need a private workstation to make you stay focused. This loft bed can be your best bet. It provides a cozy place for having a nice sleep. In addition to the cozy bed, you will also get a plenty of storages that you can use to store important files, books, or stationery. The desk and office chair make you feel like in your office, but it is much more comfortable. Having a romantic dinner under dim lights is so romantic. Unfortunately, you do not have enough space build a dining room. There is one way to overcome your problem, merging the dining room with the living room and bedroom. 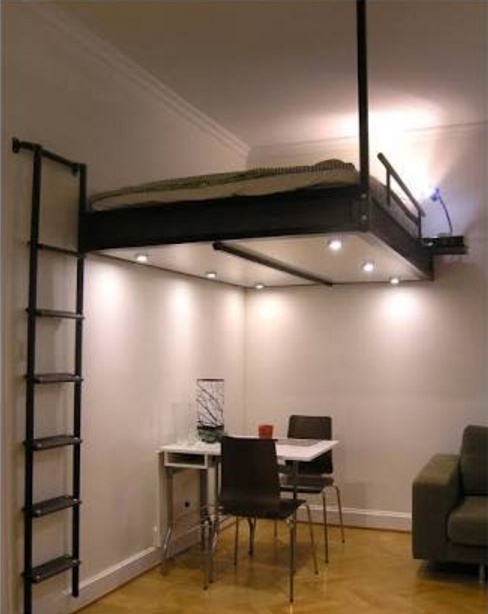 Loft bed may better your idea. You can attach it on the table and support it with metal poles so that it will look like a floating bed when you observe it from the living room. However, a different view will be exposed when seeing it from the dining room. The bunk bed will look like a ceiling with some LED lights. This is the best solution for limited space that makes it difficult for you to store your stuff. 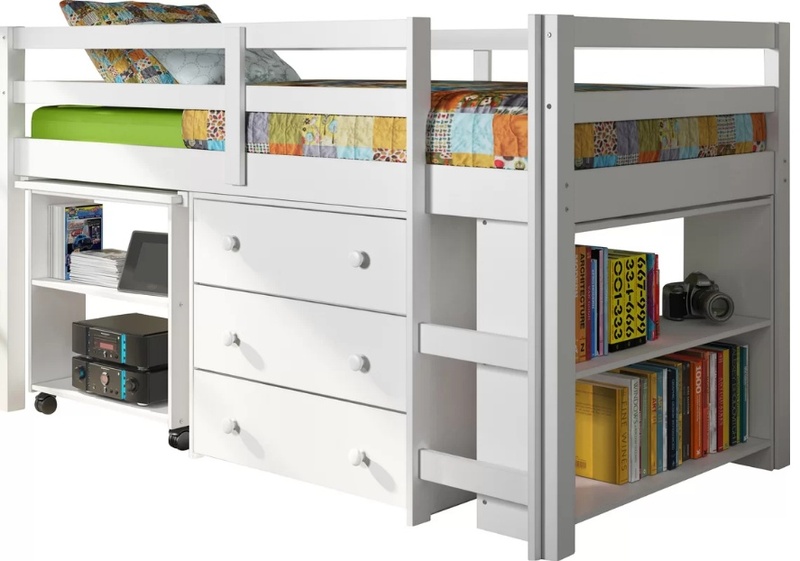 This loft bed packs a lot of storages for you since it features drawers and shelves at the same place. Now you will not find clutter in your small room due to the unavailability of bookshelves and drawers. Your room will be more spacious, and you will still be able to organize things in your bedroom. Attending many classes in campus, getting an abundant of assignments, breaking up with girlfriend── What a day! You do need something to blow off steam, something that can soothe you. Watching DVDs of action or thriller movies of your choice or playing video games in your bedroom may buck you up. Unfortunately, there is not enough space for a TV set in your bedroom. Don’t worry! Loft bed can always be a quick fix for your space issue. The space under an elevated bed can be used for any rooms or furniture including a recreational room. You can put a TV set along with a video game so that you can play it whenever you want. Black and white, simple yet elegant. That is what a minimalist bedroom is all about because less is more. 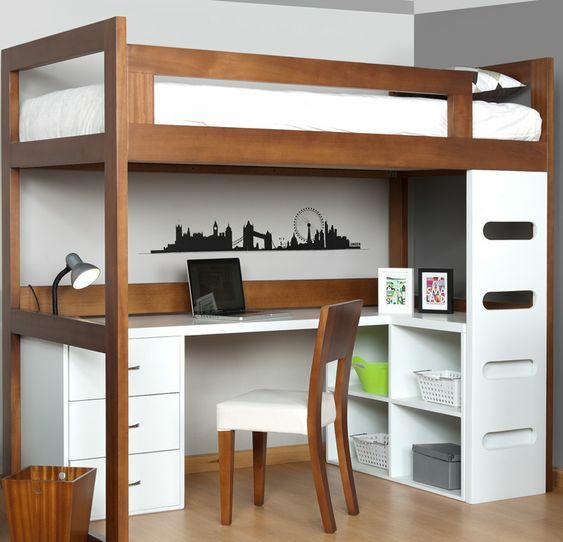 This loft bed denotes the elegance of simplicity through bold and edgy shapes and colors. It provides the Touch of elegance to your bedroom. You can have your own workstation without occupying more space. If you are seeking a super unique. It is a loft bed with surprisingly useful accessories. Again, the bed is attached on the wall. If you are looking for the stairs, you will not find them because it uses rock wall that usually find in outbond site. The way you go down from the bed is by using fireman’s pole. The bedroom has turned into an outbond site packing a lot of fun. 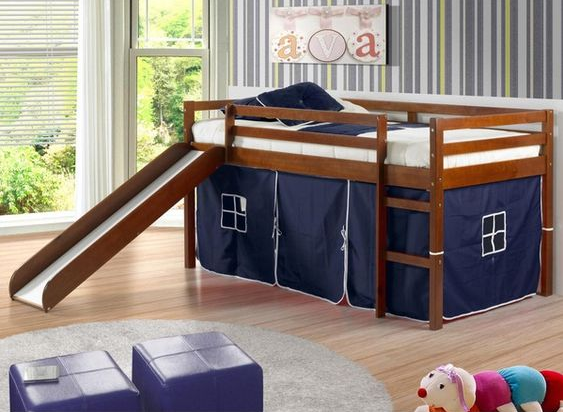 The bed features safety rails to make sure that your son is fine. The fireman’s pole and wall rocks can jeopardize your kids. Loft beds for adults can be your best bet when it comes to limited space. Those 18 loft bed ideas can help you overcome your space issue as well as sprucing your room up. It really kills two birds with a stone practical, exquisite, and impressive.